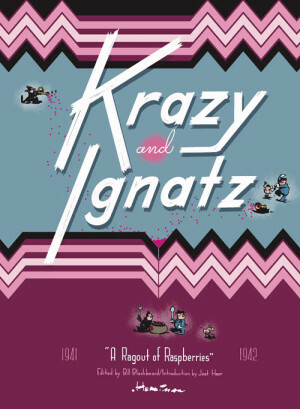 Volume nine of George Herriman’s Krazy Kat Sunday pages begins a new look for the final decade of Krazy Kat. The newspaper strip moved from the Arts sections where it was only reproduced in black and white to join many other comics in Hearst’s new tabloid comics section. This meant that Herriman’s Sunday page finally made the jump to all colour, all the time, although now the strip was only regularly appearing in the comics section of two newspapers. 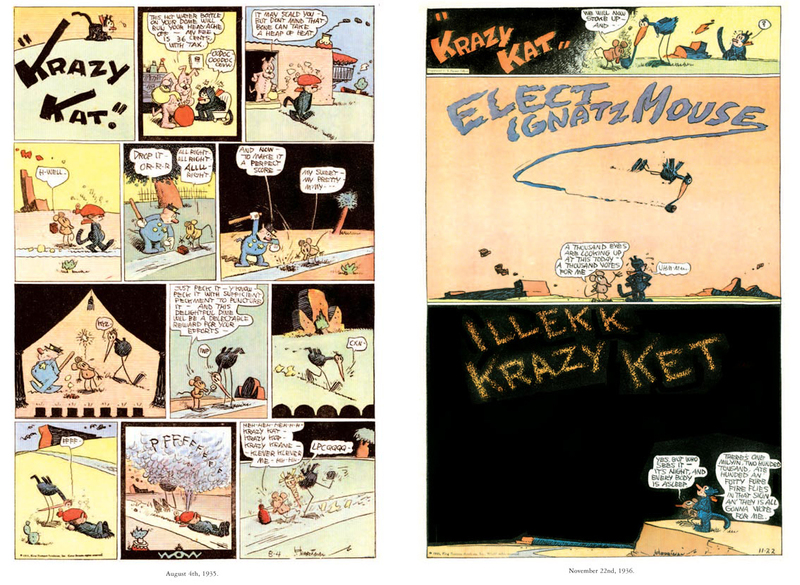 Krazy Kat had appeared in colour before. For ten weeks in 1922, Herriman drew colour one-pagers for the Saturday New York Journal, in addition to the ongoing Sunday black and white strips in other Hearst papers. 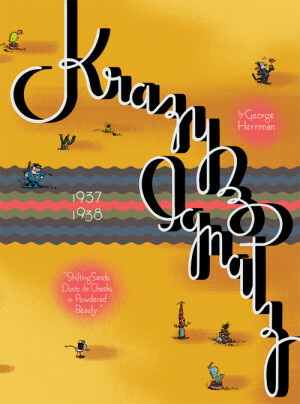 You can see those strips in Krazy & Ignatz 1922-1924: “At Last My Drim of Love has Come True”. 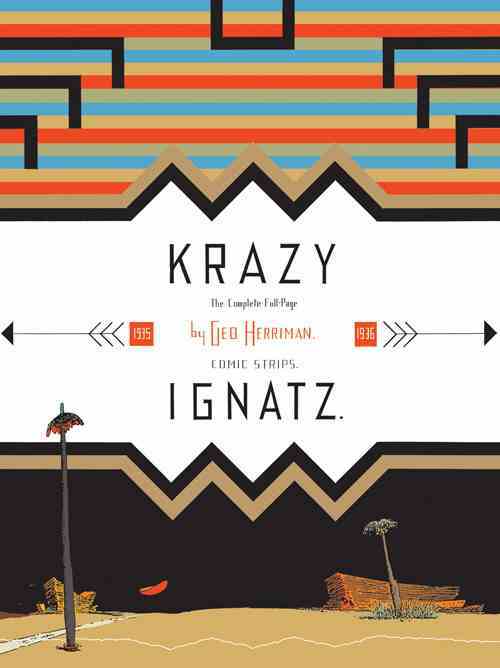 So it wasn’t a total shock to readers to look at these new-style Krazy Sundays. Along with the new colour, Herriman introduced a new character in the very first week. ‘The Growler’ was a classic mask-wearing crook whose thuggish demeanour was too much for Officer Pupp to handle, although Ignatz was as happy to paste his noodle with a brick as anyone else’s. Another guest who wanders in for a few weeks is a skinny white dog, ‘Lil Thin Dyme’ whose woeful songs pluck the heartstrings of everyone in Coconino for an extended seven weeks of Sunday pages. The introductory essay in this volume takes a look at the racial background of George Herriman. His parents were listed as ‘colored’ on his birth certificate but Herriman himself never identified as anything other than being of Creole ancestry. Michael Tisserand’s forthcoming biography promises to investigate the background meticulously, but this is an interesting opener. 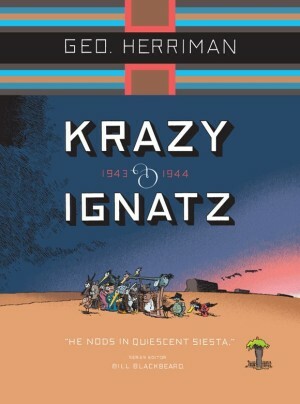 The usual watercolour sketches, photos and some pictures of Krazy Kat toys round out this volume of masterful comics from one of the true titans of the medium.